G. K. Beale has had a significant impact on students, pastors and scholars throughout his scholarly career. Despite already releasing influential works such as his “magesterial” commentary on Revelation (NIGNT), the rich and “paradigm shifting” The Temple and the Church’s Mission, the “indispensable“ Commentary on the New Testament Use of the Old Testament (co-edited with Carson), and his “magnum opus” (1,000+ pg) A New Testament Biblical Theology, I’d argue that Beale is currently at his prime. However, in light of the Lord’s work through him, Daniel Gurtner and Benjamin Gladd have worked together to produce From Creation to New Creation, a collection of essays in honour of Beale. With a stellar list of contributors (including Daniel Block, Richard Buackham, Doug Moo, and D. A. Carson), the essays in From Creation to New Creation cover three topics dear to Beale’s heart: Old Testament, use of the OT in the NT, and Biblical Theology. I couldn’t hope to thoroughly summarize and comment on each essay here but I have posted a few times on this book, which can be found here. Below, I will cover a few of the other essays and comments on the book as a whole. Beginning on a critical but friendly, note Daniel Block swims “against an overwhelming current of scholarly opinion” (p3) and challenges his own previously-held view, the notion of Eden being a temple. It’s important to note that Block is not questioning that Israel’s temples intentionally recalled Eden, but rather that the author of Gen 1-3 presents Eden itself as a temple. So: Temple -> Eden, but maybe not Eden -> Temple. Block presents thirteen (!) pieces of evidence against such a view. This essay should be studied carefully, and at the very least it serves as a corrective against overzealous Eden -> Temple connections. The fact that John Walton (a strong proponent of the view Block is criticizing) helped Block with this essay (p3, fn1) only increases its worth. An essay I thoroughly enjoyed was From Creation to New Creation: The Biblical Epic of King, Human Viceregency, and Kingdom by Christopher Beetham. Though not necessarily contributing anything novel, it was an exemplary display of Biblical theology from Genesis to Revelation. Perhaps I am biased, as I teach a class that covers much of the same material, but Beetham managed to knit together a vast number of strands throughout the Bible in a compelling and enjoyable essay. I particularly appreciated that Beetham highlighted the significance of Noah post-flood as a “second Adam” emerging from the waters of God’s judgment to a new creation, as Noah and his experience foreshadows Christ and the new creation (Rev 21-22), and I’ve found that this is sometimes overlooked. I was eagerly anticipating Watt’s essay How Do You Read? God’s Faithful Character as the Primary Lens for the New Testament use of Israel’s Scriptures ever since I saw a trailer for what I suspect is a full class on the topic at Regent. Watts proposes a fresh typological reading of how the NT uses the OT, all framed around the “constancy of God’s character” (p202); He will act as He has in the past. Watts approach has the benefit of being a deceptively simple “solution” to the difficulties in some NT fulfillment claims. Watts then applies his approach to 10 (in)famous test-cases: Isa 7:14 in Matt 1:23; Hos 11:1 in Matt 2:15; Isa 14:13-15 in Matt 11:23; Jesus as the “rock” in 1 Cor 10:1-4; Deut 25:14 in 1 Cor 9:9; Isa 28:11-12 in 1 Cor 14:21; Gen 12:7, 22:17-18 in Gal 3:16; Hagar and Sarah in Gal 4:22-6; Hos 2:23, 1:10 in Rom 9:24-25; Lev 18:5 & Deut 9:4, 30:12-14 in Rom 10:4-10. Watt’s proposal does have much going for it and helps resolve the tension somewhat, but the greatest weakness in this essay is that he tackles too many texts, resulting in each example only receiving one to three paragraphs, which is enough to give the big picture of how his proposal works but insufficient to tease out all the exegetical details. Admittedly, this is Watt’s very point: we get stuck in the trees and lose the forest. But I was left wondering how some odd-looking trees work with his description of the forest. For the sake of space I sadly had to miss other enjoyable essays such as Carson’s review of Philip Ross’ The Finger of God (which is as much a challenge to the tripartite division of the law as it is a review) and White’s intriguing non-dispensational view of the 144,000 in Rev 7 and 14 as the Jewish remnant within the church. Of course with books such as these, the quality and enjoyment of essays will vary. For me, From Creation to New Creation had the perfect convergence of scholars I enjoy and topics I am interested in, but the reader’s own interests will largely determine the quality of this book. 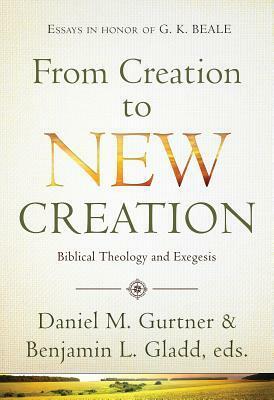 From Creation to New Creation begins fittingly for a collection of essays in tribute of G. K. Beale: with some words of praise in the foreword, preface and introduction. What struck me were the consistent claims and anecdotes that Beale’s academic work is inseparable from his passion for the church. This kind of servant-academic is desperately needed in our churches today. Speaking for myself, Beale’s writings (however much I disagree with them) have had a profound impact on me. Reading a book or listening to a lecture tends to be an overwhelming experience intellectually (as one commenter said: “pack a lunch”), but his enthusiasm is contagious. His work has not just expanded my mind but also my heart. This book was generously provided from Hendrickson as a review copy, but that did not affect my review.